"The light bulb was a Brechtian device to make the spectator aware of himself. I don't like to think of an audience in the mass, but of the individual observer and his behaviour. What he goes through while he watches is what the film is about. I'm interested in the way the individual constructs variety from his perceptual intake." 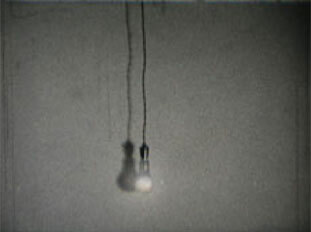 Malcolm Le Grice's film, Castle 1, combined found footage gathered from bins outside Soho's film labs and a solitary light bulb suspended directly in front of the screen itself. At intermittent points during the film, the light bulb is switched on, obliterating the projected image and illuminating the space around it. Inspired by the writing of Franz Kafka (the title refers to Kafka's novel Castle), and the painting/installations of Robert Rauschenberg, Castle 1 produces an alienating effect upon the audience, provoking in them an awareness of the cinema space and a feeling of distance from the projected image. Following on from Castle 1, Le Grice later became involved with the movement of 'expanded cinema' which involved the film-maker's direct participation in the process of projecting their films – including performances in front of the screen, as in Horror Film 1 (1971). Le Grice, who had graduated from the Slade School of Art in 1965 and in the same year took up a teaching post at St. Martin's College, began film-making in the mid-60's alongside a career as an exhibited painter. For the new generation of London-based filmmakers, some of them his own students, he was a significant influence: during this time, Le Grice was instrumental in establishing easily accessed and cheap facilities for film processing and printing for artists, which were later moved to a former industrial space known as 'The Dairy', a base for the London Filmmakers Co-op in the early 70s.